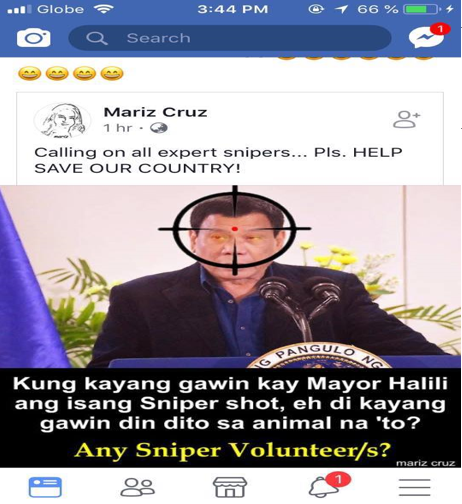 The netizen, whose name is Mariz Cruz, was lambasted by several netizens for the outright disrespect towards the President. 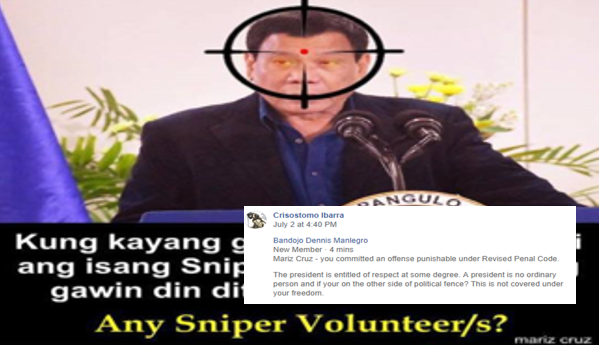 Some netizens even commented that Cruz’s actions are punishable by law. “Mariz Cruz – you committed an offense punishable under Revised Penal Code. The president is entitled of respect at some degree. A president is no ordinary person and if your on the other side of political fence? This is not covered under your freedom,” The comment reads. 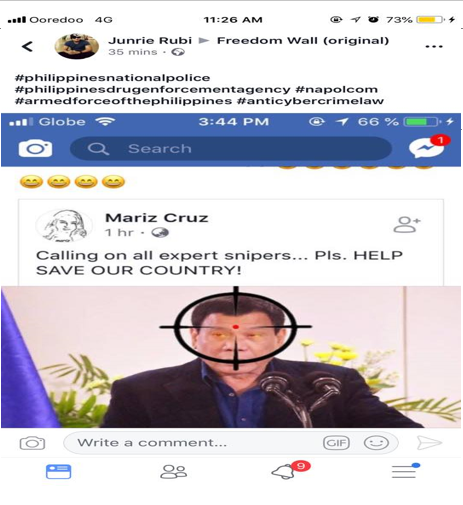 Furthermore, netizens pointed out that even if Cruz had used a fake account to make the post, the government is equipped with the means to trace her IP address and locate her. 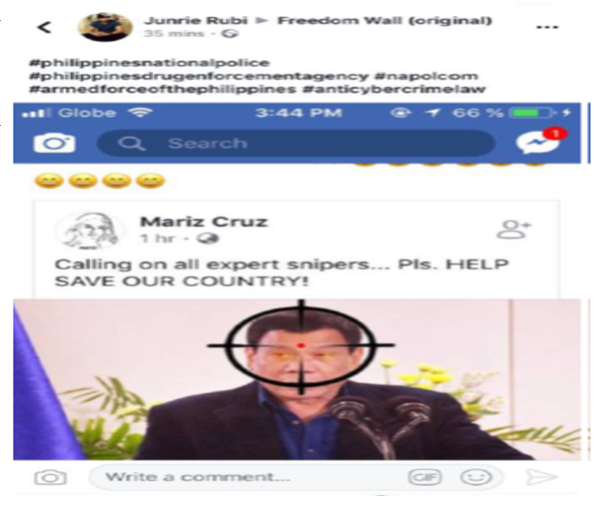 “Kahit fake yan mam..ma trace pa rin yan… my IP address kasiang ginamit ng mga fake account nay an… kaya… NTC know who they are,” Netizen Vianney Nioda Neneria commented, referring to the National Telecommunications Commission. Another netizen, Kathryn Kate Baker, furthered that had that instance happened in America, the violator would’ve been caught and penalized already. Cruz’s words posed as a threat not only to the President’s security, but to national security. 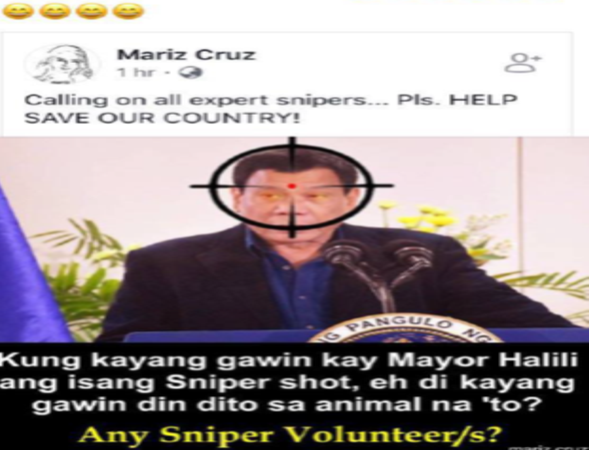 Several other netizens sought for her to be punished to the full extent of the law for her harsh and brash words, and demanded that utter respect must be accorded to the most powerful man in the country. “You’re treading on dangerous grounds Mariz. 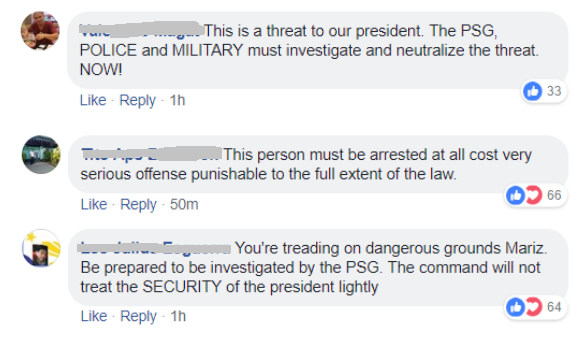 Be prepared to be investigated by the PSG (Presidential Security Group). The command will not treat the SECURITY of the president lightly,” Netizen Leo Julius Esguerra commented.